One common question that you may encounter one day when using object-relational-mapping in your application is how to slim down data that you’re retrieving from the persistence layer down to a specific subset for your use-case in an efficient manner and without using complex additional mapping frameworks. In some situations you might declare lazy loaded fields but another approach that I’d like to share with you here are JPA2 constructor expressions. Constructor expressions allow us to create plain old java objects from the result of an JPA query. The advantage is that we may use different projections for different scenarios and without being managed, the POJOs might help us save some resources here. In the following tutorial, we’re going to persist 100 book entities with multiple properties to an embedded database and we’re using constructor expressions afterwards to create smaller POJOs using a subset of the information available from each persisted book. For JPA we need a persistence provider .. often used providers are Hibernate or EclipseLink/Toplink. I’ll be using eclipselink here and Javadb/Derby as embedded database. The last dependencies are just tools – java-sizeof helps us in estimating the size of an object tree and xstream is a framework to simply serialize/deserialize pojos to/from xml. Only a few steps are needed at this point .. adding an entity, configuring the persistence unit and finally creating an entitymanager to get a hand on the persistence context…. We’re creating a simple entity here that uses the minimal set of declarations needed to make it a full-fledged JPA entity: @Entity at class level and @Id and @GeneratedValue to declare our primary key. As you can see, it is necessary to enter the full qualified class name in the SELECT NEW statement without any quotes. If you’re interested in some more detailed information about this configuration, please feel free to take a look at my JPA Tutorial: Object-relational Mapping using JPA2. It is using a small subset of the data that is available in a book entity, namely the id, the title and the author. ..finally printing out the data returned in both lists as an xml structure as a proof of concept..
.getResultList(); // list of attached entities .. expensive ..
System.out.println(books.size() + " Book entities' guessed size is: "
Running the code above should produce the following output (trimmed down to the relevant parts). There shouldn’t be much surprise .. the first structure is – if course bigger than the second one (and we don’t know what additional memory the management of the attached, managed entities cost in the persistence context is) and finally we’re getting some nice rendered xml. 100 books in the store.. 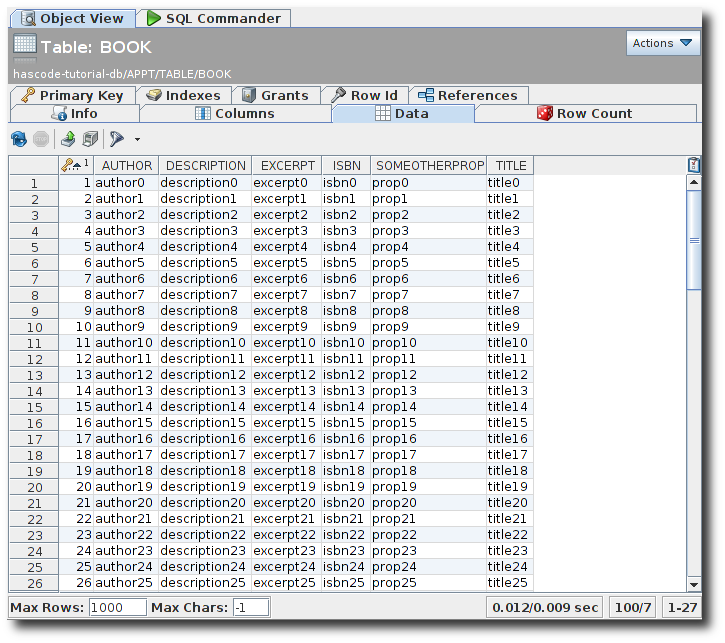 If you take a look in the derby database there should be 100 books as shown in the following screenshot. If you prefer to construct your queries programmatically using JPA’s criteria builder and the criteria API, the following code reflects the operations from the examples above but makes use of the criteria API. Another option here is to use explicit constructs – there are use cases where you need to use this syntax – especially when the constructor expression forms only one part of the result.. This entry was posted on Sunday, April 14th, 2013 at 9:00 pm	and is filed under Java. You can follow any responses to this entry through the RSS 2.0 feed. You can skip to the end and leave a response. Pinging is currently not allowed.